Now in our 31st year as a student chaper of the American Meteorological Society, MU-AMS is proud to claim hundreds of alumni in a vast network around the globe. In a field where connections are paramount, we publish an alumni newsletter to encourage a tighter-knit community of Millersville meteorology students past and present. Interested in attending a guest lecture by an invited MU-AMS speaker? Check our event calendar for upcoming speakers. Interested in being a guest lecturer? Contact us at villeams@gmail.com! Want to stay involved in AMS events and activities? Follow us on Twitter or Facebook to get the latest updates. We hope to see you at a meeting, conference, or event! The MU Department of Earth Sciences has begun an initiative to help defray the rising cost of the annual AMS meeting. As class size swells, it remains imperative to continue to provide the opportunity for students to attend and present at the AMS Annual Meeting. The annual Met-Mentor program concluded with three exciting events for our members. Our first-ever Astronomy Night brought 21 students to a practice field behind the Pucillo Gymnasium for a calm, cool, and clear September night under the stars. Two telescopes, provided by Tim Keebler and Kyle Ehmann, clearly observed the Moon, Saturn, among other star clusters and nebulas. Next up, our first-ever Ropes Course team-building event featured a smaller group of members who worked their way through a variety of low-ropes obstacles together, strengthening friendships and building camaraderie in the process. Lastly, the annual Met-Mentor Picnic at Freedom Memorial Park offered a beautiful Sunday evening with warm temperatures and sunny skies for our concluding social event of the program. President Bob Capella and Treasurer Dom Hernandez cooked up fresh burgers, hot dogs, and chicken while members walked, talked, or tossed around footballs and frisbees. It was a fantastic time for everyone who attended and we thank everyone who helped make it a success. As for future events, we are preparing to host the University of Wyoming King Air Research Aircraft during the Student Experience in Airborne Research - Mid-Atlantic Region (SEAR-MAR), a NSF sponsored educational deployment. Here, Millersville University students and faculty collaborate with University of Wyoming leads to develop flight plans and discuss operations. 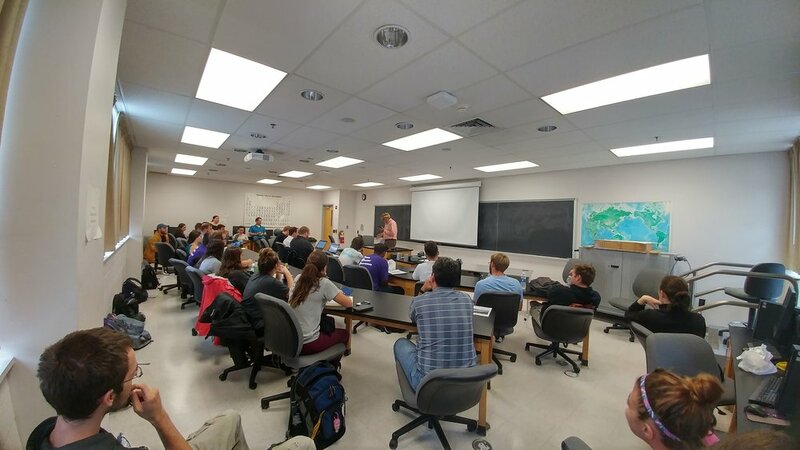 The Millersville University Student Chapter of the American Meteorological Society is a team of student meteorologists looking to enrich their careers and education through extracurricular involvement. We welcome all who are interested in the weather and climate.